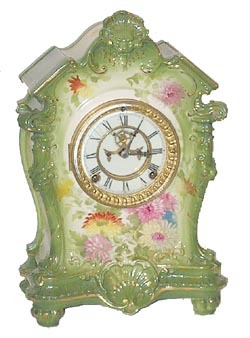 Ansonia Clock Co. Royal Bonn porcelain clock, "LaTosca", ca 1904. The name is fired into the case. One of the larger cases at 14 1/2 inches high, 10 inches wide. A very attractive medium green with hand painted pink roses, white and yellow flowers, on the front, top, and sides. A great case design, shape of shells used top and bottom, columns on 4 sides, and just enough gold go make it show nicely.8 day, strikes half hours. 2 piece porcelain dial has a half dozen small, dark hairlines. If I were keeping the clock I would put the dial in an ultrasonic bath and the hairlines should disappear, or you can get a replacement dial from Timesavers. While you are ordering get a new back door as this one is not correct. You will also need a small piece of cork to attach the door screw into. This is a simple fix that I could probably do if time allowed. No chips, cracks or repairs. It is having difficulty running long, bad out of beat. With the changes noted this clock should be worth $1200 or more. Ly-Ansonia, page 635.